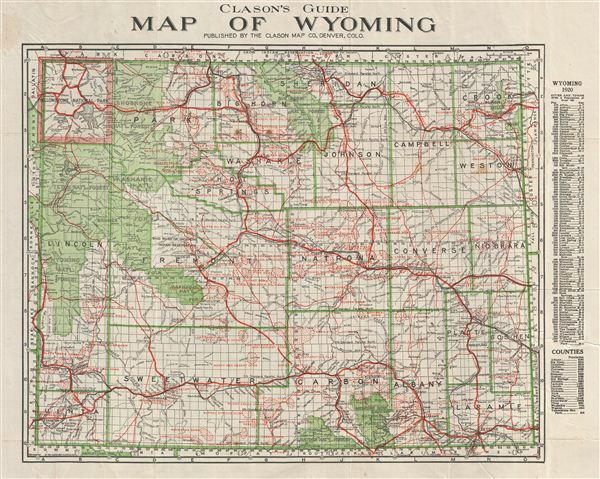 An uncommon 1920 pocket map of Wyoming by George Clason. The map covers the entire state of Wyoming including Yellowstone National Park, and the surrounding Teton National Forest, Wyoming National Forest, Washakie National Forest, and Shoshone National Forest. Shows various roadways, rail lines, and rives. Further identifies numerous monuments and geological features throughout the state. Population statistics appear to the right of the map proper. Printed by the Clason Map Company of Denver Colorado. Very good. Backed with archival tissue for stability.